During his long career, Zdzisław Beksiński worked in many fields of art: sculpture, photography, graphic art, drawing, and last but not least, painting. All of Beksiński’s paintings are untitled – he wanted to avoid any metaphorical interpretation of his paintings. As an artist, Beksiński was fascinated with death, decay and darkness. But those weren’t his only fascinations. He was also known for his interest in eroticism, abstractionism and Eastern mysticism. From the mid-1960s onwards, he was very popular in Poland. 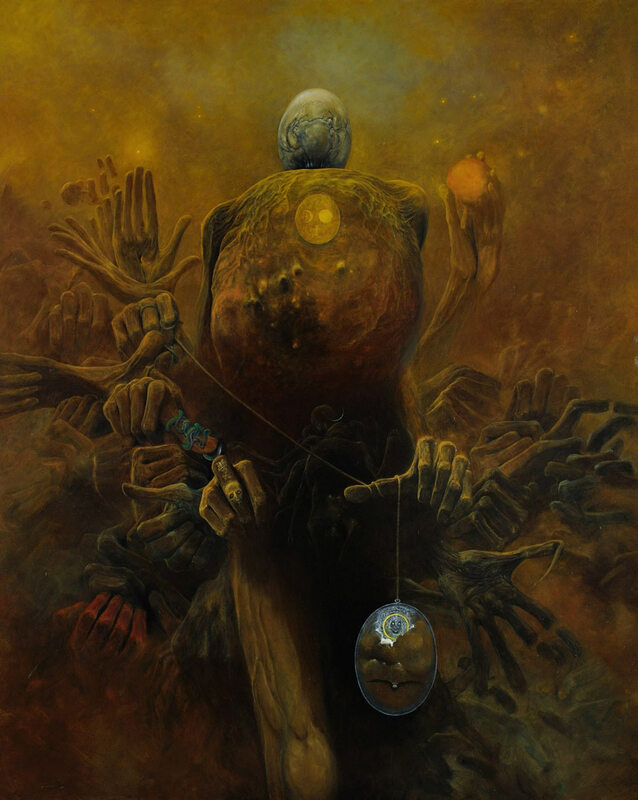 In the 1980s and 1990s Beksiński’s paintings were exhibited abroad, including France and Japan, and he became an internationally recognised artist. His style is sometimes compared to that of Hans Giger, the Swiss painter who designed the extra-terrestrial creatures for the famous 1979 film Alien. Beksiński, who was born in 1929, completed the Faculty of Architecture of the Kraków University of Technology. After working in construction, he started to work in his hometown, Sanok, as a bus designer for an automotive factory. In the 1950s, he became active as a photographer. Some of his photographic works are described as surrealistic-expressionist. One of his most famous photos, Sadist’s Corset, shows Beksiński’s liking for sadomasochistic themes. He eventually gave up on photography in the early 1960s – he had grown disappointed with the limited possibilities of altering the images he captured. Photography seemed to constrain his imagination, so he turned to drawing and painting, fields which offered the possibility of ‘photographing dreams,’ as he put it. Before he devoted himself to painting and drawing, he also sculpted for a brief period and created several abstractionist reliefs. Painting would prove to be the medium best suited to his personal vision. After having had his first successes as a painter, he was fired from the bus factory in 1967. Afterwards, he worked exclusively as an artist. 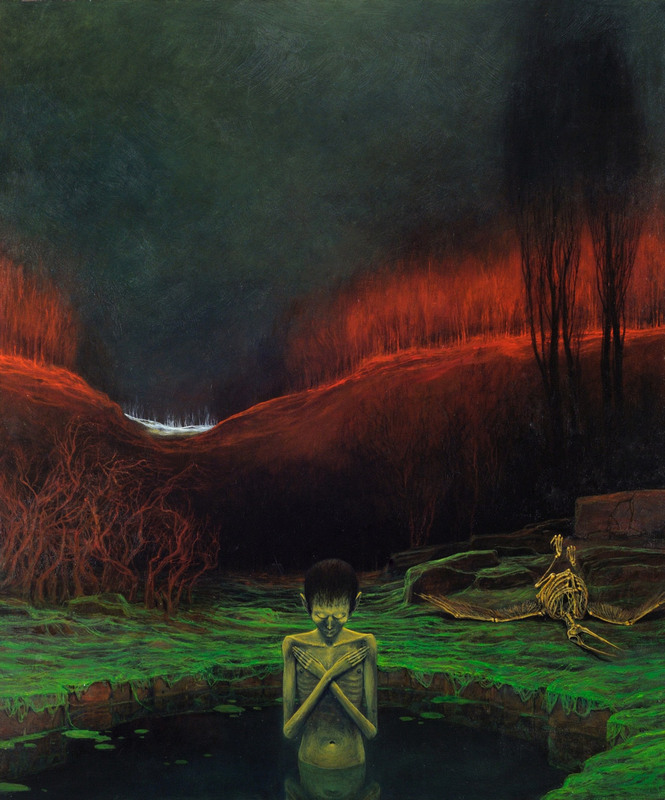 Beksiński paid little or no attention to trends in art – he had no intention of becoming a favourite of the critics. Instead he remained faithful to his dreams and obsessions, which in the end won him great popularity. In the 1960s, he created a number of sadomasochistic drawings. From the end of the 1960s to the mid-1980s, he began working on his most famous period – his ‘fantastic’ series. The predominant themes in these oneiric works are hellish landscapes depicting disturbing nightmarish figures and grim unearthly architecture. These made him a household name in Poland and brought him recognition abroad. After the so-called fantastic period, Beksiński’s style changed and he entered a period he described as ‘gothic.’ The paintings from the gothic period represent deformed heads and less dreamlike figures, which display a specific plastic harmony. When the computer editing of images became possible in the 1990s, he was granted his wish of being able to add surrealistic alterations to photographs, and his career came full circle as he returned to his first medium. Beksiński lived with his wife Zofia and their son Tomasz in Warsaw, where the three of them had moved from Sanok in 1977. In the capital, the painter led a rather uneventful life – he spent most of his time at his apartment working, listening to music and watching movies. He didn’t like to go out, socialise or travel. Yet the series of misfortunes that befell Beksiński and his family caused the story of his last years to become very well known. In 1998, his wife died of cancer. A year later, Tomasz, an esteemed translator and popular music journalist, committed suicide. In 2005, the painter was stabbed to death at his apartment by his cleaning lady’s 19-year-old son. Beksiński, who knew the killer, had refused to loan the teenager money. Understandably, his tragic last years have since often been linked with the grimness of his art. Many have been inspired by Beksiński’s art. In Poland, his works influenced many rock musicians, and lately the creators of the point-and-click adventure video game Tormentum. The noted Mexican film-maker Guillermo del Toro, who directed the Oscar-winning film Pan’s Labyrinth, is a known admirer of Beksiński’s works. A Polish film about the family’s life after 1977, The Last Family, was released in 2016 to much acclaim.